This evaluation is designed to assess bodily signs which may relate to nutritional imbalances. 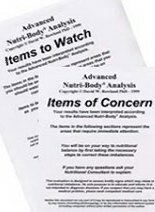 Nutri-Body Analysis analyzes 65 nutrient categories using the Nutri-Body Questionnaire. Lengthy Questionnaire to make you think, about YOU! Kim Ode, Holistic Health Practitioner to review your printed results in person at one of our stores. you your customized scored assessment. Click Here to take the Online Nutri-Body Assessment only. Does not include an appointment with Kim Ode, HHP. - Includes assessment and printed results either mailed or emailed back to you. if added on at a later date. Base Pricing will be shown when you make your selection. Base Pricing will be adjusted to include current Washington Sales Taxes. After you select, and pay for your assessment option your order will be sent to our secure retrieval site. folder as well, in case it ends up there. or after hours, you may not receive your assessment until our next open business day.